To meet high demand, Second Harvest Heartland is committed to developing new sources of fresh, wholesome food. 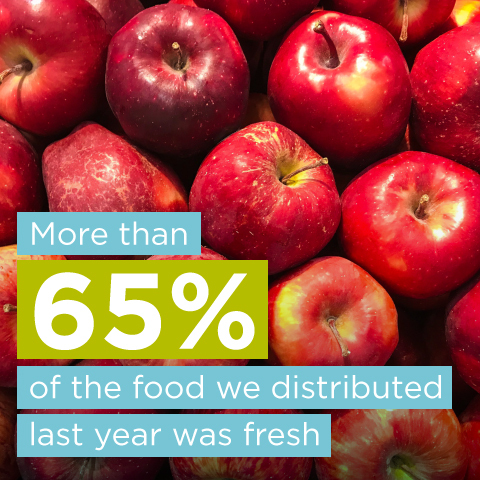 We are proud of the increasing percentage of fresh food we offer, including agricultural surplus such as apples, corn and potatoes. Last year, we collected 5.57 million pounds of 20 different types of produce from 29 Minnesota growers. The Bill Emerson Good Samaritan Donations Act is a federal law ensuring that donors are protected from any civil and criminal liability, as long as the product is donated in good faith. In addition, our distribution center is AIB Compliant, ensuring that your donation will be handled safely. We encourage businesses to donate food and grocery products worry-free. For more information about the Good Samaritan Donations Act, click here. Featured partner: Jerry’s Foods Inc.
Second Harvest Heartland would like to highlight Jerry’s Foods Inc. for their contribution to the Food Rescue Program in the Twin Cities metro area. In 2016, Jerry’s Foods Inc. stores provided more than 1.6 million meals to our neighbors in need, including fresh and nutritious produce, dairy, and protein items. Jerry’s Foods Inc.’s commitment to being an integral part of their communities as “The Neighborhood Place” shines in their Food Rescue Program!